Ojo, your interview on Atheist Analysis triggered this hole [sic] host of emotions and thoughts in me. Thank you for your openness. I won’t pretend I share your new-found belief but can certainly appreciate a lot of what you said. A lot made me quite sad. Wonderful article! Both you and Ric have strengthened my faith. You have been burned and for that I am sorry.. But the Christian faith is historic and evidential and will NEVER go away. Thank you for making me realize that while people change, the truth of the message does not.. Love you guys and thanks for your honesty!!! Hey Brother!!! Jesus Loves You! He believes in you even if you don’t believe in Him. Listen to you [sic] heart brother. It knows. God Bless you my friend. This is just a small sample. I get messages like these all the time. 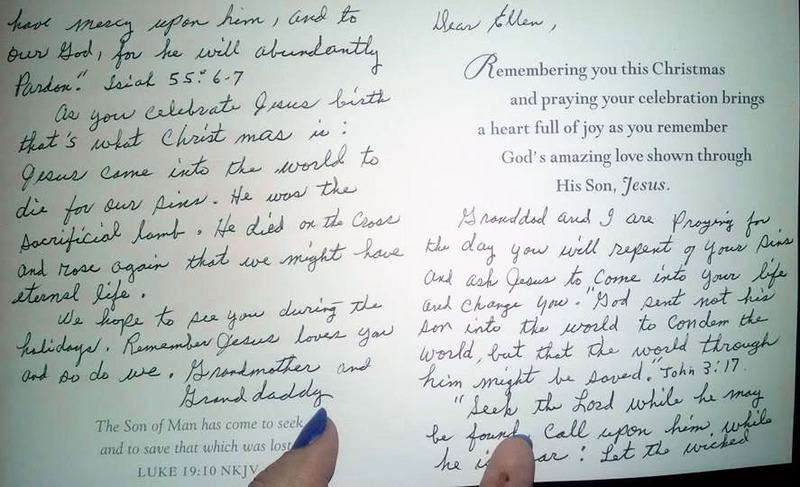 Well, it is the holiday season and around the time these showed up there was a post about this Christmas card going around, received by an atheist from her grandparents. Well-meaning? Concerned for her well-being? Or is it manipulative and some kind of passive-aggressive, these well wishes all wrapped up in the appearance of a festive, warm fuzzy wrapping? I really don’t know how to interpret these things and I seem to have three options. 1) Perhaps these folks just want to wish me well, express their good thoughts and intentions to me and are just completely tone deaf about how these messages sound. Is it not possible to do this without bringing religion into it, or is this the only language they speak and understand? Do they not realize that it’s kind of like the equivalent of me sending them a note saying, “ Wishing you well and just wanted you to know I sent a donation to the Freedom From Religion Foundation in your name. Cheers!” In fact maybe I should keep track of these things and publicize that I will send in a dollar to the FFRF for each one I get. 2) Or perhaps they primarily want to wish me well but cannot bring themselves to simply do so without making some kind of religious statement at the same time. They know what they’re doing. They think that they are making a public confession for Jesus, or that they are actually doing some good towards bringing me back into their fold in what they think is a loving manner. Do these people really move through their worlds this way? 3) Perhaps these messages are meant to simply preach and make a religious point that’s wrapped up in the appearance of good wishes at the same time like the Christmas card, a sugarcoated pill, a gorilla’s chest-thumping. If so, why not just preach? Why not just make the point? Why frame it as a greeting complete with a sign-off and everything? This one is the most manipulative to me. On the other hand, people that make such posts should understand that I do not feel compelled to attend every argument I am invited to. Silence should not be interpreted as capitulation, ceding the point or validating the arguments in any way. Sometimes it’s simply just too boring, mundane, pedestrian, over-worn or tired, already debunked in any number of places. If any of this is you, if you do such things, please consider the implications of what you are writing. Think about how it will be received, how you would feel if someone sent or posted an unsolicited political or religious message they know you don’t agree with on YOUR wall, bereft of understanding and acceptance of your own path. If any of this is you, let me assure you that you do your faith, beliefs and practice no good at all by walking into someone’s house with your dirty feet, by feeling the need to trumpet and affirm your own beliefs to someone who doesn’t share them, or by qualifying an otherwise nice word by saying that you don’t agree with them. Jesus is not proud of you and it scores you no points. Having said all this, I do usually take the good wishes at face value. It is always nice to be thought of and always nice to have goodwill sent my way. I gladly accept all good wishes, warm thoughts, healthy intentions, any respectful and genuine questions about my path or journey, any sincere exchange of ideas. If any of this is you and if that’s your purpose, welcome! But please wipe your feet at the door. This entry was posted in Freethought and tagged Atheism, sincerity by ojotaylor. Bookmark the permalink. Sadly, I was one of those people, not so long ago. My journey has not led me to a place of agnosticism, or atheism, but it has redefined what I believe, drastically. I’m at a place, now, where I understand that it’s not my job to “save” people (wherever that means), or woo them back (i.e. Badger them until they comply) to my form of faith, lest their souls burn forever in hell. (#sarcasm) Jesus said that he came to bring life in abundance and to set the captives free. Why is it, then, that we work so hard at imprisoning people, instead of freeing them to seek and find the path that leads them to their own personal idea of fulfillment?